There is a mystery to be solved and twists to be, uh, twisted but it’s a bit unfair to judge 2011's Restitution by regular thriller metrics because it doesn’t play by them. The film begins with a lengthy exposition depicting a private investigator Bryan following up on clients suspected of insurance fraud. The film then picks up one year later as true crime novelist Alex (Mark Bierlein, who also produces and writes the screenplay) comes to Detroit to investigate Bryan's murder. He needs to find the mysterious Lawson’s Law Office, interview Bryan’s girlfriend Heather (Mena Suvari, American Beauty), and stay one step ahead of disappearing witnesses. Along the way he meets wacky neighbor Tom (Tom Arnold, True Lies) and corporate types who know more than they’re letting on (William Sadler and C. Thomas Howell). Also, there are drugs involved. Somehow. The pulpy dialog often delves into camp, there are far too many establishing shots of Detroit, the villains are mustache twirlers, and the film never settles on a tone, shifting wildly from Tom Arnold’s motor mouthed comedy to brooding intrigue. Speaking of Arnold, it’s obvious that he adlibs half of his lines, his energy stands in stark contrast to Mark Bierlein’s more stilted delivery, and let’s be honest, it’s a stretch for him to be considered military material. From shots that last too long to scenes that probably should have been left on the cutting room floor, everything about Restitution is just “off.” It’s not bad enough to be taken as campy comedy, but isn’t good enough to stand next to titans of the thriller genre. Restitution’s plot is actually pretty interesting, and the bizarre nature of the film is a result of the film’s low budget, odd editing, and the difference between an “interesting” and an “airtight” screenplay. Anyone who approaches Restitution expecting something along the lines of a Heat or a Se7en will be sorely disappointed. However, for those who can embrace the surreal atmosphere, outside of the meandering first portion of the film, Restitution is a watchable bizarro thriller. 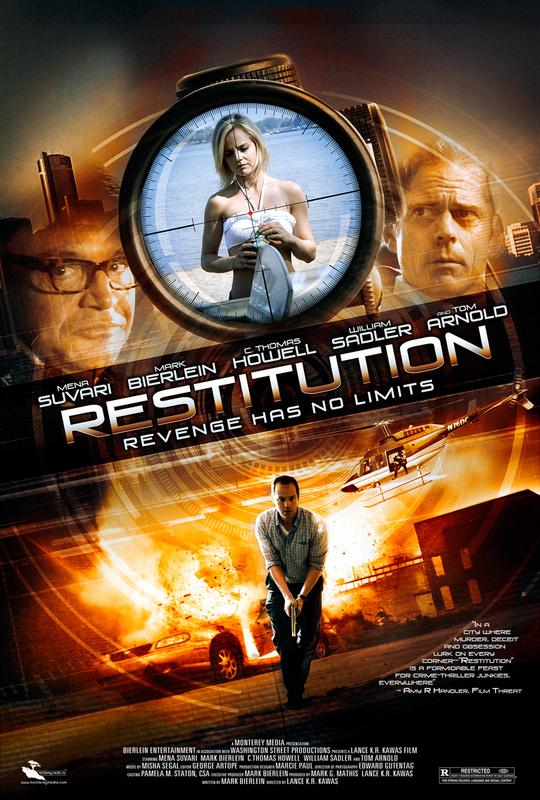 Restitution is directed by Lance Kawas who also cameos as a coroner, gets a “story by” credit and acts as a producer. Restitution was viewed at the 2012 Uptown Film Festival in Birmingham, MI.